While steaming to South Korea, Iranian-owned tanker ship Sanchi collided on Jan. 6 with a Hong Kong-flagged cargo ship CF Crystal. 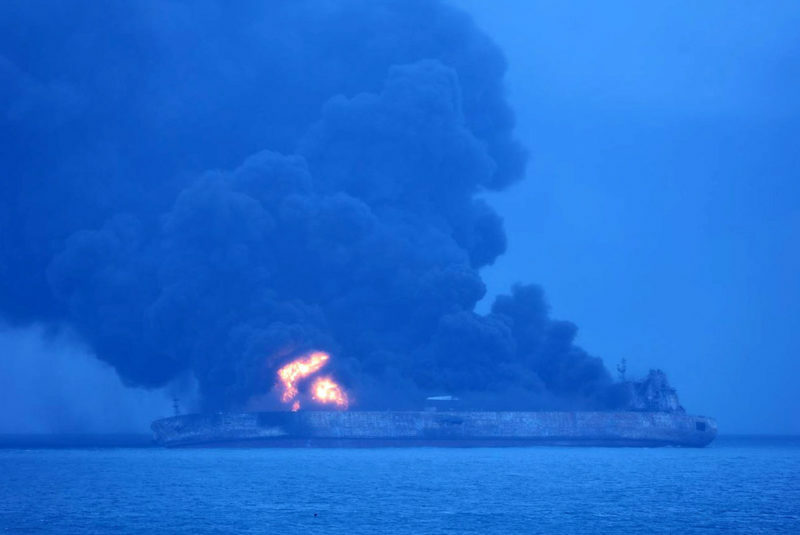 The resulting fire, and now sinking, could result in one of the worst-ever fuel spills at sea, according to news reports. Sanchi was carrying nearly 1 million barrels of a highly combustible fuel substance called condensate. Predicting how much of the substance will ultimately end up in the water is not easy because condensate burns off fast, compared to other heavy fuels, and it’s possible some of Sanchi’s tanks were still full when the ship sank, according to experts cited in a National Geographic report. Environmentalists and fisheries officials fear the damage done to this region could be immense. While the cause of the collision is still being investigated, Iran on Tuesday prepared its next shipment of condensate to be shipped to South Korea, according to a story reported by Tehran-based Financial Tribune, an English-language Iranian economic newspaper. South Korea is Iran’s largest customer of condensate, and receives between five and seven shipments monthly, Financial Tribune reported. The Chinese government, which was leading the search and rescue mission, announced three bodies of sailors from Sanchi had been recovered, and presumes the remaining 29 sailors still missing were dead, according to news reports. After the collision occurred, the U.S. Navy sent a P-8A aircraft to assist with the search. Since then, the Navy had not been asked by the Chinese government to provide any additional resources, a Navy spokesperson told USNI News.